Looking for the best Moz alternatives? 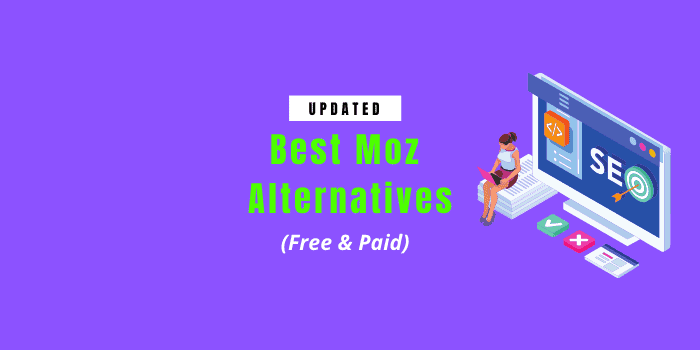 In this article we list (and compare) 10 best Moz pro alternatives for 2019 that are better than what Moz offers, and cost way less than what you’d pay for Moz. Click here to skip this & view our recommended tools! Moz along with their top-notch blog on SEO, their free and paid tools, the search community forum and whiteboard Friday videos can be rightfully called one of the pioneers of SEO. However, with the ever-evolving world of SEO you need to be fast-paced and that’s where I think newer (yet powerful and constantly evolving) SEO tools started to outrank Moz as the favorites of marketers & bloggers. Many of Moz alternative SEO tools offer much more than what Moz offers (like CPC value, better keyword research or site audits to name a few) at a much lower price. If you’re a SEO freelancer or an SEO agency that manages client SEO or provides SEO services, you got better alternatives than Moz. So, here are 10 Moz pro competitors that give more bang for your buck. If you’re looking for the perfect alternative for Moz, it has to be SEMrush. Not just a SEO tool, SEMrush is an all-in-one marketing suite that helps you manage SEO, paid traffic analysis (ad strategy, competitor’s paid traffic analysis etc), social media marketing and even PR (brand monitoring, discover trending topics etc). 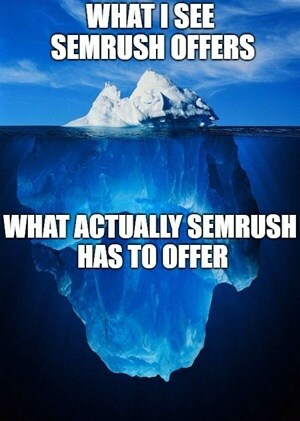 With over 2.9 million users, SEMrush definitely knows how to be the best value for your money SEO tool. Read my hands-on review of SEMrush to see how it can help you. writing perfect content that in-depth and covers all topics (LSI keywords & phrases) using their brand new SEMrush writing assistant tool. …this is just the tip of the iceberg that I use mostly. SEMrush offers a LOT more (I use them but not so much since they’re outside the scope of my work) like paid marketing or PPC data, PLA analysis, marketing calendar, social media poster and heck even a Baidu rank tracker! Content audit, site audits to see if everything’s okay. The pricing (which is in line with what similar tools in the same space charge) might be an issue if you’re someone just starting out. There are so many use cases and features that come with SEMrush and not everyone will use every tool they provide. SEMrush pro plan: Helps small businesses, bloggers and freelance SEOs with limited budgets. It helps you run your SEO, PPC, SMM campaigns easily. It costs you $99.95/month. SEMrush guru plan: Perfect for most SEO agencies, the SEMrush guru plan hits the right chord with all pro features plus branded reports (great for presenting customized reports for clients, historical data, and extended limits (5000 reports per day, up to 1000 results for traffic analytics, 50 projects, 1500 keywords to track and over 300K URLs to crawl per month).This is by far the best plan for marketing agencies with a cost of $199.95/month. SEMrush Business plan: If you’re an established marketing agency or eCommerce owners or simply anyone with a massive web presence, this is the right plan for you. Coming with a price tag of $399.95/month, the business plan brings you increased limits to all reports, white label reports, API access and 200 projects under one account. SEMrush Enterprise plans: This is a custom tier plan where you can customize everything SEMrush offers based on your needs. Moz doesn’t offer even half of what SEMrush does (it is because Moz is now a solely SEO tool and not a full-fledged marketing suite offering SMM or PPC results). Moz plans cost a little less than SEMrush’s ($99, $179, $249 for standard, medium and large plans respectively) but for the features it provides, I don’t think it’s worth the pennies saved. Ahrefs, like SEMrush, is a all in one marketing tool set that comes with a better UI and probably a bigger database of backlink data, crawled pages and more. Ahrefs crawls 6 billion web pages every single day with a index size of 12 trillion known links. One more factor that I liked about Ahrefs is their user interface that is modern, airy and never lets you feel distracted or bored while performing deep competitor researches using it. Ahref’s keyword explorer is something I spend a good deal of time with and it is by far one of the best keyword research tools based on Clickstream data with all the goodness of KWFinder plus some more (like pulling out question keywords and more). Ahrefs has the best backlink data (6 billion pages crawled every single day and index is pumped up with new data every 15 minutes). It is great to find incoming links to both you and your competitors’ site. You can filter it based on language, CMS and more. It also enables you to see new links, lost links and pages with the best or most links for a domain. You can also get an idea about how much traffic a particular backlinks brings to the linking page. Ahrefs content explorer tool is another cool feature that makes it a perfect Buzzsumo alternative to find trending content, sort it based on referring domains, links pointing to them and organic traffic they receive. Using the “highlight unlinked domains” option, you can also filter out sites that already link to you to only get results from sites that have never linked to you and so you can use that and get some fresh referring domains. SEO toolbar to help you get metrics easily and directly from the SERPs. Competitor analysis with “gap monitoring” to see what keyword opportunities you are losing out to competitors. Organic research with top pages, search features (featured snippets, image pack etc) and top keywords for each individual page ranking. Regular tutorials that help you make the most out of their tools rather than regular usage. Unlike SEMrush, it has no integrations with Google analytics or search console. Low limits on the bottom plan which I feel is a bit restrictive for bloggers who will have to pay higher to get a full report. Agency plan starting at $999/month but can be customized and prices may vary according to that. Ahrefs provides a 7 day trial for only $7 with complete access to the tool. SEO Powersuite isn’t a standalone product, it is a bundle of some of the Industry’s best SEO tools like Rank Tracker, Link Assistant, Website Auditor & SEO Spyglass. It is also the only Moz alternative that is not a web-based SEO tool. Together these tools add up a powerful moz alternative that is a must-have for your SEO arsenal. Rank tracker as the name suggests will help you track the keyword rankings of your website or client website. Unlike other cloud apps listed in this list, Rank Tracker by SEO PowerSuite gives you the ability to track unlimited keywords (great if you’ve a multiple sites or clients to manage). You can track the keyword positions based on search engines (Google, Bing & Yahoo), country, city and even an exact address (good for local SEO). One of the most important tasks of affiliate SEO or client SEO is outreach and Link Assistant helps you do just that. Link Assistant helps you find valuable link sources, gauge them based on your metrics (social strength, alexa rank (duh!) domain age etc) and then outreach them directly via the app. This is one of my favorite SEO tools in the PowerSuite bundle. Leveraging a SEO Spider, website auditor audits a website for its HTML, CSS, JS, Flash content etc. With the website auditor you can view your site’s architecture, pages (along with their titles, HTTP status codes), on page SEO, and a lot more. SEO spyglass generates backlinks reports based on all links pointing to your (or your competitors’ sites), highlights harmful incoming links, highlights backlinks that generate traffic (referral traffic from source sites) etc. You can also use SEO Spyglass to compare 5 of your competitors’ backlinks data side-by-side. You can also generate domain comparison reports amongst others. The pricing is one-time but you have to pay nearly $9 per month after the first six months for updates based on change in search algorithms. I wouldn’t prefer a software version when the cloud apps like Ahrefs, SEMrush are very fast and easy to use. Their outreach tool (Link Assistant) isn’t as good as you can find using tools like SEMrush or Ahrefs. Please note: You have to pay a nominal monthly fees (after the first 6 months) to keep your software updated with current algorithm changes and other updates. If you’re looking for a free Moz alternative, you might have a hard luck finding one, but luckily we have a cheaper alternative to Moz that can definitely save you some bucks. I got this tool as a lifetime deal on Appsumo which makes it even cheaper for me. Serpstat is relatively newer as compared to biggies like SEMrush or Ahrefs but it does provide a good competition to them by targeting the budget conscious market. Make sure to read my Serpstat review to see why it is a favorite tool for bloggers that is way cheaper than SEMrush or Ahrefs. With clients like Shopify, L’Oréal and Lenovo as their clients, they’re sure to be offering some pretty cool competiton to Moz and other SEO tools in this list. Serpstat has a decent keyword database of over 100+ million keywords and provides keyword stats from 15 countries. You can further filter out results based on featured snippets, other search features (like queries in people also ask for section) local maps, shopping features etc. Helps you compare multiple domains side by side and see how they fair against each other in terms of traffic, keywords etc. It measures domain quality or strength via Serpstat page rank or Serpstat trust rank (its own version of Moz DA and PA). With Serpstat you can perform thorough research based on what keywords are bringing paid traffic to your competitors, ad examples etc. Other notable features include a keyword monitoring tool, website analysis tool, site audit, backlink analysis & checker etc. Serpstat is fairly cheaper allowing the starters or budget conscious people get their hands on a very decent alternative to Moz pro. PPC data and research that Moz doesn’t provide. The link and keyword database is is smaller as compared to SEMrush or Ahrefs or Moz for that matter. Serpstat offers the widest range of pricing plans ranging from $19-$299 for personal users. While it goes up to $2500 for business users or agencies. For personal use, it is the best cheap Moz alternative you can get. Last but not least, on our list of best Moz alternatives is, Majestic. Majestic is not the jack of all trades. It doesn’t do keyword research or site audits or brand monitoring for that matter. What it does, and does exceptionally well at, is backlinks. Majestic has the world’s largest link index and helps SEo professionals and agencies get some very awesome data regarding referring domains, anchor text cloud, historical data of links and more. Majestic helps you get some highly relevant backlink data that Moz or Moz alternatives don’t provide. Clique Hunter (helps you find sites that link to more than one of your entered domains. Good way to find low hanging fruits for outreach or link building opportunities). This is not a con by any means just a disclaimer that this tool doesn’t provide a range of SEO tools like keyword research, organic research, content explorer etc. They’re aren’t hiding it either, they are a tool that specializes in backlinks and link data. The lite plan gives access to only fresh index (links data in the last 3 months) and not historic index. Next on our best Moz alternatives SEO tools list is Nightwatch which has a futuristic UI and a lot of features that bloggers and SEO agencies look for in an ideal SEO tool. Apart from key SEO features (I’ll discuss below) it let’s you integrate your site’s analytics and search console with the software t give you exclusive insights about your website’s search performance. It is one of the best cheap Moz alternatives you can get your hands on. Apart from the best Moz alternatives listed above, here are some bonus SEO tools that are not complete replacements for Moz (like the above) but help you offer cheaper solutions. Raven Tools is a unique SEO tool for client management that offers white-label reports for SEO, site audit, backlinks, rank data and performance metrics for Google analytics, Adwords, Facebook, and Bing ads etc. Spyfu is another powerful SEO tool that helps you access the top ranking keywords of your competitors, every ad they’ve bought (from Google) and every single ad variation they’ve ever launched in the last 12 years! Spyfu also helps you get contact details (email, social media handles, address) for any domain you enter. Click here to read an in-depth review of SpyFu to see what more the tool offers. Web CEO is another SEO software with white label reporting that offers a range of tools some of which are the best free Moz alternatives you can find. They do offer a 14 day free trial so it’s a perfect deal for those wanting a free Moz alternative to try before buying. SEO profiler is a all in one SEO tool that replaces almost every single SEO tool suite you use. It offers a wide variety of SEO tools including automated SEO audits, on page SEO, off page and local SEO, link analysis, daily rank tracking, website optimization tools, uptime monitoring and team work. Not to mention, they offer exportable white label PDF and web-based reports. SEO Profiler is free to try for 30 days. My Verdict: What Is the Best Alternative for Moz Pro? If you’re looking for an affordable or cheap Moz alternative, I’d recommend SEMrush for you. It offers every single feature that Moz provides plus a lot more that can help you maintain a perfect SEO portfolio. If you’re an SEO professional into client SEO, SEMrush provides you with lots of options like site audits, content audits and more that can widen your range of services. You can also send customized PDF reports to clients. If budget is the only obstacle coming your way, I think Serpstat is the perfect Moz alternative that you can use and still get mot of what the best (like Ahrefs or SEMrush) can offer. What’s your favorite amongst these top Moz competitors? Do you use any of these alternatives to Moz or you have access to some other cool SEO tools? Hi Swadhin great piece of information. I think ahref is the best alternative for moz in terms of website stats analysis whereas for keyword research i will prefer Semrush. Thanks Alan. Ahref is my go to too!